Wondering if there is anything that you can do to reduce the chances of your child developing celiac disease? Researchers have been investigating if there is an optimal time period to introduce at-risk infants to gluten. 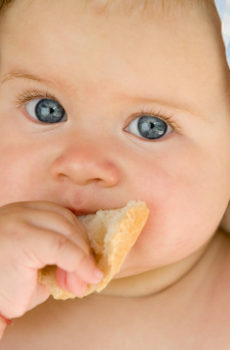 Preliminary findings suggested that gluten should be introduced to at-risk infants between 4-6 months of age. More recently, researchers randomized 832 at-risk newborns (i.e., born to a parent with the HLA celiac gene) to receive gluten at 6 or 12 months of age. At 2 years of age, infants who had been introduced to gluten at 6 months were more likely than those infants introduced to gluten at 12 months to have autoimmunity and celiac disease. However, by 5 years of age, there were no longer significant differences between the two groups and this trend continued when the youth were 10 years of age. In sum, the findings from this large scale randomized controlled trial revealed that timing of gluten introduction to at-risk infants did not reduce development of celiac disease by 10 years of age. The researchers recommend further research to examine if delaying the introduction of gluten (i.e., to at least 12 months of age), which delays the onset of celiac disease, offers any developmental advantages to youth. Although this research suggests that both timing of gluten introduction and breastfeeding do not reduce the chances of development celiac disease among at-risk infants, there are still important steps you can take to improve your infant’s health. Preliminary findings point to the importance of the mother’s gut health as a key factor in the child’s overall immune system and health status later in life (i.e., likelihood of developing obesity and other lifestyle-related diseases). If you have gut relates symptoms (e.g., gas, nausea, constipation, bloating) and are thinking getting pregnant or are pregnant, book an appointment with a member of our team to learn how you can improve your gut health and optimize your baby’s health.